The Datavideo TP-100 Smart Phone Teleprompter allows you to read the contents of the screen of the smartphone by looking at the camera lens. Equipped with a clear 60/40 glass, it offers easy readability to the speaker and allows the camera to capture high-quality images. You can use the teleprompter to create self shoot projects, video blogs, and corporate video podcasts. On installing the DV prompter software, you can remotely control the speed of the prompter script and jump between break marks via a 9.8’ (3m) wired i-remote. You can load the scripts or cue sheets into the smartphone software via email and control the timing of the content through the remote. The remote also allows you to customize the background color, font type & size, and many other features on a fly to enhance the readability of the content. The DV prompter software allows you to edit and schedule it with the help of instant Script Editing and Timing option. You can quickly review all the document scripts and make last minute changes to the content and timing with the help of built-in text editor. The strong and rigid camera hood attaches rigidly to a wide variety of camcorder lens threads. 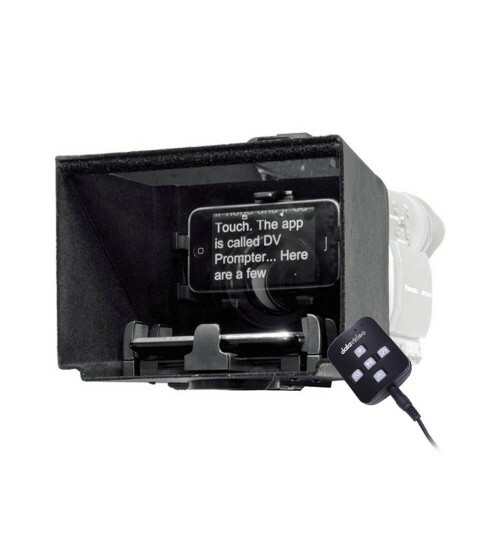 Equipped with a smartphone cradle, the TP-100 Teleprompter supports smartphones of all sizes. It has a quick and simple set up, and requires no special tooling.